Tseju.. Thanks. Feels good to be here. Tseju. Hair means beauty. Hair completes me. Hair for me stands one woman out from the other. Tseju.. Once a month cos I can actually do somethings on my own. Hv.. Oh! Some things like..
Tseju.. I can curl my hair by myself. Hv.. Ok. You can curl your natural hair or your weaves, or both. And how do you do that? Tseju.. My weaves. I just sit in front of the mirror. Hv.. How long is your natural hair? Hv.. Haaaaa. Is that true, and does that inform ur decision to stick with weaves? Tseju.. Yaaaa. My hair is not full, its a bit scanty. Hv.. Dont worry, same here. Lmao. Why did u start the hair business? Tseju.. 1. Love hair. 2. Was difficult for me to get good hair around, had to always travel far to get good hair. Hv.. What range of products do u sell? Tseju.. We do all range of hair, braids, synthetic, fibre, virgin hair. Tseju.. Short. Do long to make hubby happy. Hv.. Really. Lol. Ok. Curls or straight hair? Hv.. Explain the difference between human hair and synthetic? Tseju.. Human hair is in two calsses. One is the low quality in packs like Chocolate, Supreme, Blackpearl etc. And the other is the raw virgin hair. It could be Brazilian, Peruvian, Cambodian.. Synthetic are not hair, like Expression, Amigo products, most times cant be re used, washed, dried, curled. Hv.. Pls expantiate, chocolate, Supreme, blackpearl? And then Cambodian, this is the first time im hearing of Cambodian hair. Tseju.. Chocolate, Supreme and blackpearl are brand names. They are in packs. While Cambodian are real donor hair. Real hair from human. Hv.. Ok. What you're saying is that donor hair does not come in packs. Tseju.. Yaa. Most people now brand human hair(raw virgin hair) in nice packs now. Packaging. Hv.. Abi na. Lol. Is there any difference between human hair and virgin hair? Hv.. Ehn ehn. Noted. Lol. When deciding what hair to buy, what are the things our audience should consider. Hv.. Pls Explain. How does weather affect the kind of hair you want to buy? Tseju.. when its hot(sunny), dont think its the best time to fix 40 inches hair. Hv.. Lolzzz. Is there really 40 inches? Tseju.. Yes there is 40inches. Tseju.. I advise you give to professionals because even if you know what to do you might not be using the right products. Hv.. Ok. But when you wake up in the morning, what do you do to your human hair in order to 'get up &go'. Tseju.. I just wake up and apply leave in conditioner/serum, depending on which I think its necessary that morning. Hv.. Whats the role of each, leave in conditioner or serum? curls while serum gives shine. Leav in conditioner detangles. Both serum/leave in conditioner softens the hair making combing easy. Hv.. Ohh I get. I use leave in conditioner, but I still notice a lack of shine. Soo, that means one has to get both. 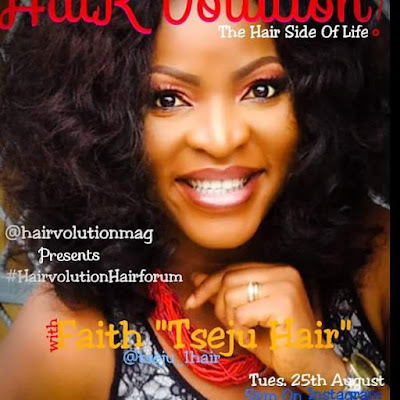 Hv.. Tell us more about your hair business, how has it been, what has been the challenges, and how have u been able to overcome. Tseju.. Tseju hair is situated in Festac, determined to give customers value for their money. And oh yes its been good..we give God the glory. Challenges! Some trips to get virgin hair are not funny at all, and the rise in foreign currencies is another. But in all, we keep pressing on, what has to be done, has to be done. Hv.. True or false, there is a rise in the demand for virgin hair in Nigeria. Hv.. Uhnnnmmm, that means business is good..
Hv.. Loll. Thank God. What advise would you give someone thinking of starting hair business? Tseju.. Get a mentor and start. Hv.. What are your price range? Tseju.. Depending on what you're buying. From 450,000 to 300,000. Remember we do all range of hair. Hv.. Finally, what words do you have for your customers? Tseju.. Yes I will. Thank you for having me.